Before seeing 33 Variations, Moises Kaufman’s play exploring why Ludwig van Beethoven composed the titular arrangements seems like a big “No, thank you.” But sometimes we have to look deeper to find the gem that lies within something. Kaufman and Beethoven did the same thing. I took a chance by arriving at the Eugene O’Neill Theatre at 9 a.m. to wait for rush tickets, instead of the more customary (and safe) 8 a.m. I didn’t think the billing of Jane Fonda would pull a big audience from people my age, and the play has been performing to average house capacities of under 58 percent for the past four weeks. Those factors make for no guarantee that there won’t be a… well, rush for rush, but in this case, my guess was accurate. Only two other rushers joined me in line a few minutes before the box office opened. 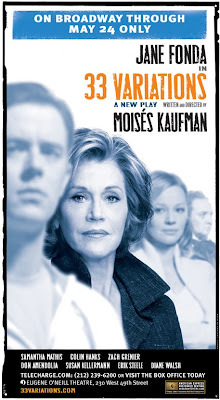 33 Variations participates in the rare policy of only distributing one rush ticket per valid ID. Who goes to see a play alone?! Yes, I often do; but attending a theater performance is usually a social event, which a rush policy shouldn’t hinder. In addition, the ticket price is $30 – an annoying $4.50 above the standard amount. However, the tickets are in the front row, center section. I was shocked they were giving those seats for this play. The view was fantastic, and being that close to a film legend like Fonda was a special experience. SPECIAL NOTE FOR SPRING AWAKENING NERDS: It was definitely odd to be back at the Eugene O’Neill and not for a performance of the Sater/Sheik musical. Has anyone noticed that the font used for the 33 Variations logo is exactly the same used for Spring Awakening? I recognize that highlighting this fact outs me as an absolutely sick person, but I can’t help it – I thought it was interesting. Going into this show, 33 Variations had unlikability written all over it. In addition to the premise failing to spark an immediate thirst, it seemed pretentious. A woman (a “musicologist,” no less) trying to discover why Beethoven spent his waning years composing variations of Anton Diabelli’s waltz – why should I care? Besides, how many Beethoven scholars in the house are there? But what it proved to be is an incredibly well-acted, beautifully staged story about two people living in different eras (a-la The Hours) discovering the things that are important in life. Call me a softie, but that subject never gets old. Each member of the cast delivers, forming a wonderful ensemble accomplishment. Fonda is the star, but she doesn’t force anyone into the background. She maintains her magnetic quality, a fixture of her reputation which precedes her, and smoothly transitions to each different stage of Dr. Katherine Brandt’s character. Susan Kellermann is superb as Dr. Brandt’s research partner Gertrude. She makes her entrance as an uptight frau, but her transition to lovable confidant is subtly endearing. Zach Grenier’s performance as the mad, brilliant Beethoven is both those traits, and his rendition is nothing short of amazing to witness. Now that is embodying a role. Another player who creates the ensemble’s general excellence is Erik Steele, who plays Anton Schindler, Beethoven’s loyal assitant. His steadfast devotion to Beethoven, especially in his weakest hours, are admirable, and Steele plays it with unwavering conviction. Actually, it is the characters of Schindler and Gertrude that reveal one of the sweetest aspects of the play. The two loyals serve as the pillars of strength for the paralelling stories of Beethoven and Dr. Brandt. And since the play’s meaning is all about what’s important in life, it makes us reflect on our own lives and appreciate the people that have always been there for us throughout. While the play’s moral is by no means trite, the snag I see lies with Dr. Brandt. If Kaufman was intending to portray Dr. Brandt’s metamorphosis from emotionally absent mother and take-everything-for-granted human being to complete opportunist, then there isn’t enough background information presented to drive the point home. Dr. Brandt doesn’t seem too removed from her daughter (Samantha Mathis) and appears to have enjoyed life as much as any average person has. I just don’t know that Dr. Brandt is on “Ebenezer Scrooge” or “George Bailey” levels of needing a life lesson. Two aspects of this play were striking: the acting and the scenery/lighting. In the wings are towering shelves of old books and vintage storage bins. The look is like that of an old, musty library, but with classic style. Derek McLane’s panels of sheet music are not only beautiful, but serve as a perfect reminder that music is what is driving these characters. And the use of projections (a growing trend in theater, not always with great success) is almost mesmerizing in this production. Created by Jeff Sugg, the projected images of written music over sheet music is layered enough to create an abstract feel that catches the eye but doesn’t distract it. 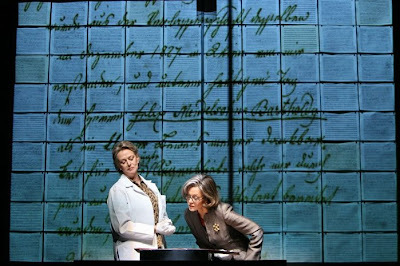 And the lighting created by David Lander when Dr. Brandt and Gertrude are examining documents in the research lab is spot on – even with a minimalist set, the lighting alone tells the audience where the characters are at this moment. These factors made 33 Variations an amazing visual experience and created stylish and meaningful tones. I wish every “boring” play could be as enjoyable as 33 Variations turned out to be. I found Moises Kaufman’s play to be quite the contrary. No doubt it had the potential to fulfill its dismal prophecy. But as Beethoven, Dr. Brandt, and Kaufman all discovered, it’s the little things that matter.